1 Whether this is a Notification to establish complaint cell or it also allows restoration of commuted portion of pension alongwith increases as ordered by the Superior Courts? Finance Department’s Notification No. FD.SR-III/2008 dated 30-01-2015 has been issued for establishment of a Complaint Cell for the purpose specified in the said Notification. 2 Whether this Notification is applicable to the petitioner pensioners or it is also applicable to all the eligible pensioners irrespective of the fact that those pensioners were petitioners or not? The schedule of time given in the Notification referred to above is applicable to only the petitioners. 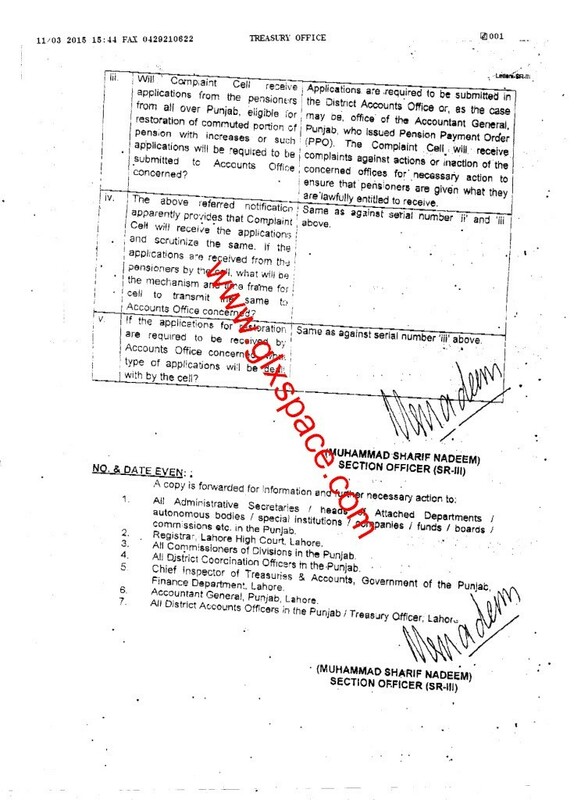 Other pensioners may also submit their applications to the District Accounts Officers or as the case may be, office of the Accountant General Punjab who issued their pension payment orders (PPO) in case they have not been given pension including restoration of commuted portion of pension as prescribed in the applicable rules and increases. If any, in pensioner, as sanctioned, from time to time by the Govt or they have any other lawful grievances. Such pensioners may also submit their complaints to the Complaint Cell for their lawful grievances and not redressed by the concerned DAO/TO/AGP. 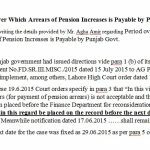 3 Will Complaint Cell receive applications from the pensioners from all over Punjab, eligible for restoration of pension with increases in pension or such applications will be required to be submitted to Accounts Office concerned? 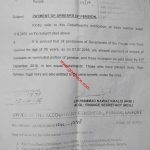 Applications are required to be submitted in the District Accounts Office or as the case may be office of the Accountant General Punjab who issued their PPO. The Complaint Cell will receive complaints against actions or inactions of the concerned offices for necessary action to ensure that pensioners are given what they are lawfully entitled to receive. 4 The above referred Notification apparently provides that Complaint Cell will receive the applications and scrutinize the same. If the applications are received from the pensioners by the Cell, what will be the mechanism and time frame for cell to transmit the same to the Accounts Office concerned? Same as against serial number ii & iii above. 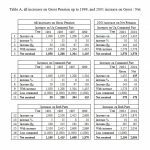 5 If the applications for restoration of commuted portion of pension are required to be received by the Accounts Office concerned what type of applications will be dealt with by the Cell? Same as against serial number iii above. 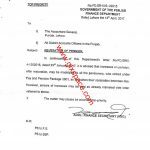 It is to mention here that the Punjab Govt later on 10-02-2015 again issued the Notification for further Clarification Regarding Restoration of Commuted Portion of Pension. 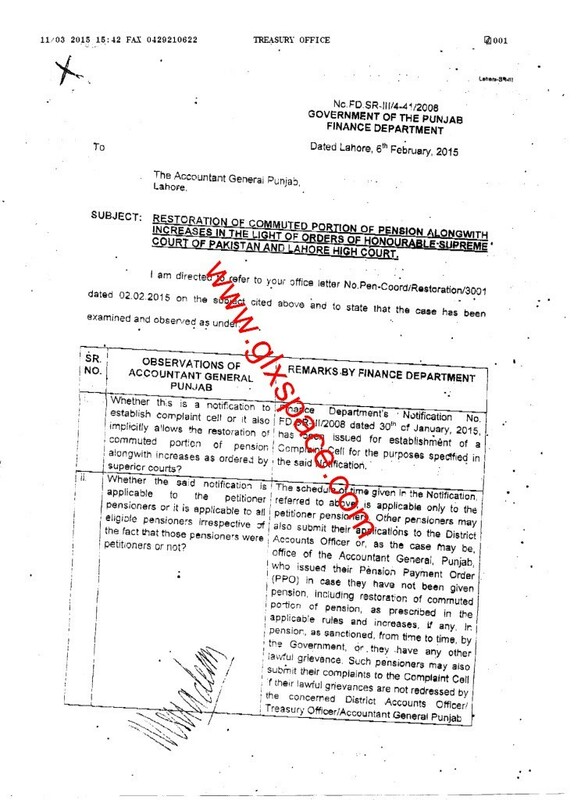 Special Thanks to Mr. Abdul Ghafoor Mirza for sending the copy of the Clarification Regarding Restoration of Pension by Finance Department Punjab. If a pensioner dies before 75 years of age, his family pensioner (wife) will entitled for restoration of comuted portion of pension on completion of 75 years of age period of decased pensioner. Dear Irshad Naseem according to my knowledge "Yes". respected sir .i have two questions about old pensioners.No.1 kia 30 saal ki service k baad her saal k ivz jo 2% izafi pension milti thhi kia us ki bahali ka koi chance h? No.2 kia new pensioners ko bhi izafa gross pension per milay ga .is ka bhi koi chance h? Dear Iftikhar filhal extra 2% kay chances nahin hain. 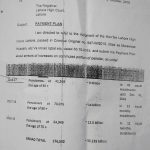 New pensioners ko izafa sirf netpesnion-medical allowance per hi hoga. Yeh sirf pension restoration ki soorat main gross pesnion per hoga. Past few years my father is looking this kind of notification, undertaking, etc..
but still government of punjab is not interested to give benefit on year 2001 restoration part of pension. Are they really interested to give? Dear M. Ali I hope the soon all the matter will be settled. I am looking for Punjab Govt notification of Clarification of Medical allowance (fixing minimum limit to 1200). If someone have, do share with us.